One of the major differences in the overall park is that you won't find a "kiddie land". Instead, family friendly attractions can be found in all the lands. This helps to keep families together during their day at the park. In the Beach area, you'll find a new carousel next to a refurbished MegaZeph. There is also be a small stage in this area. 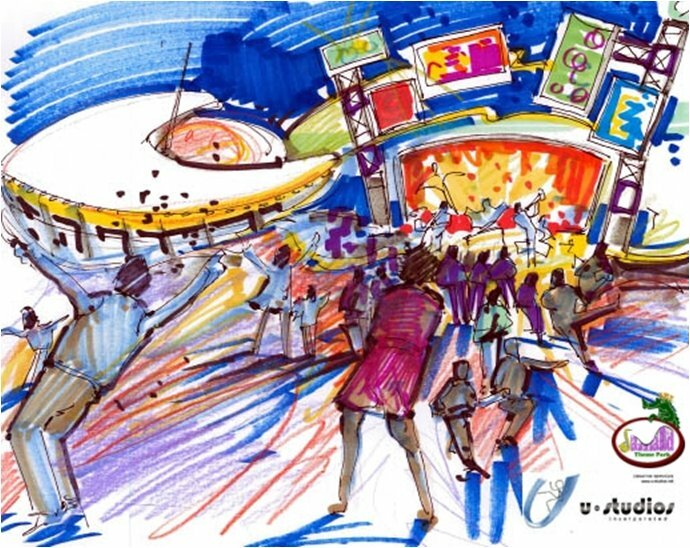 The Paidia Company submitted a proposal to re-open the park as a true celebration of Louisiana by connecting the dots of community, history, identity, and artistry in a living testimonial to our spirit and pride. Additionally, we propose to add a water park and movie back lot to the site. This proposal for Jazzland includes locally owned businesses and is working with area youth organizations to offer internship programs and art & music education programs at the park. Families of New Orleans would like to be able to bring their children to the park again. The City is trying to attract more tourist by showing them that there is more to the City than Bourbon Street. Jazzland is a perfect fit to add to that campaign and to attract more families to visit. The infrastructure is already there for it to be a THEME PARK. Historically, the park attracted over 800,000 guests annually while operating seasonally and competing with Astroworld. Today, the closest regional park is over 450 miles away and we plan to operate year-round. © Copyright 2015 TPC-NOLA, Inc.